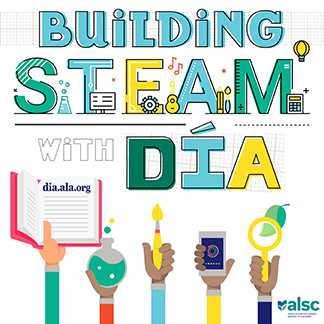 At a recent system-wide back-to-school meeting, a fellow NYPL children’s librarian (Christy Lau) presented on an innovative approach her branch had taken to summer reading registration: creating a symphony out of registrants’ names. Christy and her partner-in-crime, Sean Ferguson, are much better equipped to explain what I mean, so read on to hear from them. Where did the idea for the visual part of your Summer Reading display come from? As we do for every Summer Reading program, we wanted the kids to be able to put something up on the wall with their names on it. And with this year’s theme being music, we thought it appropriate to use music notes! While preparing the Children’s Room, we were looking at this bare wall that goes up along the staircase and the thought occurred to us that it would look really cool as a grand music staff for the notes to go on. Did you always intend for the display to involve an auditory component? Where did the idea for that aspect come from? No, actually. The idea for the auditory component came after the kids started placing the notes. 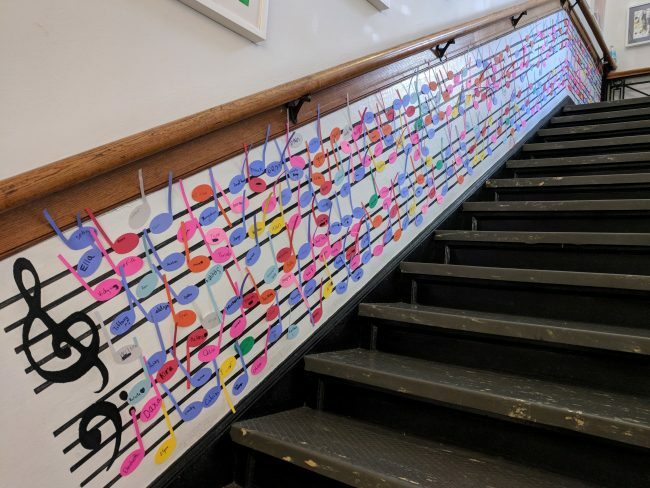 When each child signed up for Summer Reading, they picked a colored music note to write their name on and then placed it wherever they wanted on the staircase wall. Sean, as our in-house musical genius, recognized the formation of melodic material and thought there might be a way to turn this mess of notes into an actual musical piece. We quickly realized there was a way to bring this to life, and for the kids to be able to hear their (unintentional) creation. So at the end of the summer, after all the notes had been placed, we had our piece. What software did you use to create the music? How much time/effort was invested? The first step was to use Photoshop to isolate the individual colors on the photograph we took of the wall. Then Sean transcribed each color set onto music manuscript paper, assigning individual colors to orchestral instruments (e.g. dark blue = piano, green = clarinet, etc.) and used the handrail supports as measure markers; we gave the most frequent colors to the single-note instruments like trombone and clarinet. Sean then inputted the transcription into Finale (a music notation software) to create the full orchestral score. The next step was to export MIDI files from Finale and import them into Pro Tools (a digital audio workstation software) where the MIDI files were assigned to orchestra sample libraries and then finally mixed and bounced down to an audio file. The piece repeats multiple times so certain instrumental groupings can be featured until it finally culminates in a rousing tutti (where all the instruments play together as displayed on the wall). If you were doing this over again, what (if anything) would you change and why? We would have had the music staff extend all the way to the third floor of the library, utilizing three walls worth of space instead of being restricted to the one. We would also have used more colors, but we ran out of card stock paper for the music notes. And – had we the resources available to us – we would have had the music notes attached to electronic triggers that would have made the wall interactive! Ideally, the kids could have pressed a colored button at the bottom of the stairs and, like a bouncing ball, the corresponding melody would play out loud for them… Ah, the pipe dreams. Christy Lau is a children’s librarian and ukulele enthusiast. When she’s not reading graphic novels or playing the uke, she’s in the kitchen baking lemon rosemary scones. Her spirit animal is her cat Yoyo. Sean Ferguson, Library Manager, moonlights as a composer and musician – writing chamber music and film scores, playing in several bands, and even producing the NYPL Sings: Songs for Our Children record that came out early 2018. 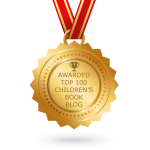 Christy and Sean would like to give a special thanks to the children and staff of Chatham Square Library. Kudos to Christy and Sean! 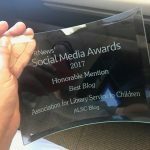 We’re (NYPL–Lower Manhattan Network) VERY PROUD of YOU! !